Maintaining consistent clamping pressure in any bolted assembly generally depends on three factors: the amount of force applied, effective gaskets, and in certain applications, the use of o-rings. It is often assumed that uniform pressure is applied by the bolt head and nut as force is applied, but factors such as dimensional and surface irregularities, uneven torque, and other external forces can cause interface pressure to be inconsistent. Gaskets are often used to compensate for lack of contact or force consistency across the mating surface, either caused by the fasteners (bolted joints) or surface irregularities. They are typically made from sheet material such as paper, rubber, silicone, soft metal, cork, felt or plastic. Gaskets have a tendency to 'settle' and compress or even deform, causing the bolts to loosen and the clamping pressure between the two mating surfaces to become compromised. Moreover, the thickness and density of the gasket material used, along with operating conditions such as high temperature also can cause the gasket to settle. An o-ring (also known as a toric joint) is another type of gasket, nested within a groove and compressed to form a circular seal, typically around a cylinder or circular opening. O-rings are made from a variety of rubber and polyethylene compounds that are designed to operate in different environments and under different pressure loads. Over time, the material can begin to break down and lose compression consistency due to high pressure, high temperatures, and lack of lubrication. 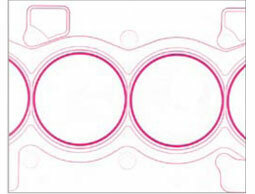 As with other gaskets, this distress can cause fluid leakage and diminished internal pressure. Insufficient Torque is the rotational force applied to a bolt and nut to assure it is tightened to within a set parameter (e.g. 1/2-13 GR 8 Bolt, unlubricated, has a recommended tightening torque of 107ft lbs). If too much torque is applied to a bolt, the structural integrity of the bolt itself can be compromised and under certain operational loads could stress to the point of breaking. If insufficient torque is applied, then the bolt will not have the needed force required to hold the two mating surfaces together. In the case of a cylinder head and cylinder block in an automobile engine, this could result in the loss of surface contact and allow the combustion gasses, cooling water and oil within to escape through unsealed surfaces. 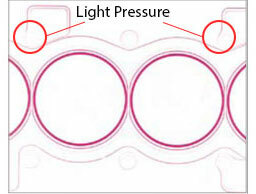 Gasket Stress refers to any load applied to the gasket surface. It is one of the most important variables of a bolted joint assembly, impacting the gasket's ability to seal. For example, softer, more conformable gasket materials may seal at a much lower stress level whereas harder materials, such as metals or composites, will require a much higher compressive load. 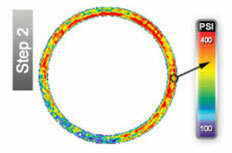 Variables that typically place stress on the gasket include 1) conformity to the flange surface, 2) material permeability, 3) ability to withstand internal pressure, and 4) temperature. Conformity occurs as force (compression) is applied to the gasket. 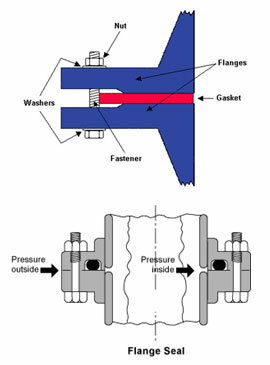 Depending on the flange surface, more compression force may be required to get a suitable seal between the flange surfaces. In theory, if both flange surfaces are completely flat, a gasket would not be required. The gasket conforms to these imperfect surfaces to create a seal. The greater the imperfections, the more force is required to create the necessary seal. Additional clamping force is required to block the gasket material's permeability. This involves blocking the leaking of fluids or gasses through the material of the gasket itself. By increasing the clamping pressure, the chance for leaks decrease. When using a soft material, or a non- metallic gasket, higher compression forces are required to make sure internal pressures do no leak, or blow out through the gasket seal. By increasing the friction or the force compressing the gasket between the flanges, the chance for such blow outs will be eliminated. High temperatures can cause gaskets to relax. This relaxation will cause a subsequent relaxation in the bolt load. Often times bolts need to be re-tightened after the gasket is first introduced to heat to ensure the necessary compression force is still being applied. Typically, the amount of pressure applied by bolts upon two mating surfaces and the gasket is low, between 28-350 PSI (2-25 kg/cm2), so either the Ultra Low (LLLW) or the Super Low (LLW) Fujifilm Prescale types are most applicable. The sensor film should be placed on both sides of the head gasket and reassembled, torquing bolts to their recommended load. Then loosen the bolted interface and remove the Prescale film. The force measurement will be visible on the film, similar to the results shown in the two examples above. Note that load duration, both surface temperature of the contacting surfaces and the ambient room temperature, as well as relative humidity can effect results. Refer to the Prescale color correlation chart to further analyze the results, taking into consideration temperature and relative humidity. Uneven Seal An o-ring is a type of gasket designed to form a mechanical seal between mating surfaces to prevent leakage into or out of the joined objects. For example, in the case of hydraulic cylinders, o-rings prevent the leakage of hydraulic fluids. Temperature plays a large role in the failure of o-rings, causing the rubber compound to break down if used in conditions above the o-rings temperature rating. 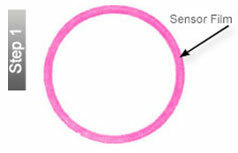 Inconsistency in the o-ring design or the nesting groove can allow an ineffective seal to be formed. Such failure can mean the difference between a product design's success or failure. Place the sensor film between the load surfaces. Once operational compression force has been applied, remove the film. The results will be visible on the film, similar to the results shown above in the STEP 1 image above. STEP 2 shows more detailed analysis via pseudocolor enhancement using the Topaq® software system to better understand the pressure profile. To learn more about the image enhancement and statistical analysis capabilities of Topaq, follow this link.